The electrolyte level of the vehicle battery should be checked regularly in high-mileage vehicles, in hot countries and in older vehicle batteries. The vehicle battery is otherwise maintenance free. Vehicles with a start/stop system ( ) are fitted with special vehicle batteries. For technical reasons, it might not be possible to check the electrolyte level in these vehicle batteries. Preparing the vehicle for working in the engine compartment . If a cover is fitted: press the tab in the direction of the arrow and take the cover up and off. If a sleeve is fitted: fold the cover away to one side . Ensure that enough lighting is available in order to see the colours clearly. Never use naked flames or glowing items (e.g. cigarettes) as a light source. 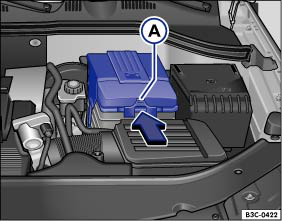 The colour display in the round window on the top side of the vehicle battery will change according to the electrolyte level. Light yellow or without colour The electrolyte level of the vehicle is too low. The vehicle battery should be checked and replaced by a qualified workshop if necessary. Black The electrolyte level of the vehicle battery is correct. Any work on the vehicle battery can cause serious chemical burns, explosions and electric shocks. Always wear eye protection and protective gloves. Never tilt the vehicle battery. 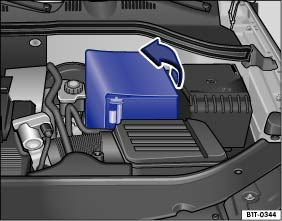 Electrolyte may spill out of the battery vents and cause chemical burns. Never open a vehicle battery. If acid is spilt in your eye or on your skin, rinse immediately for several minutes with clear water. Then consult a doctor immediately. If acid is swallowed, consult a doctor immediately.